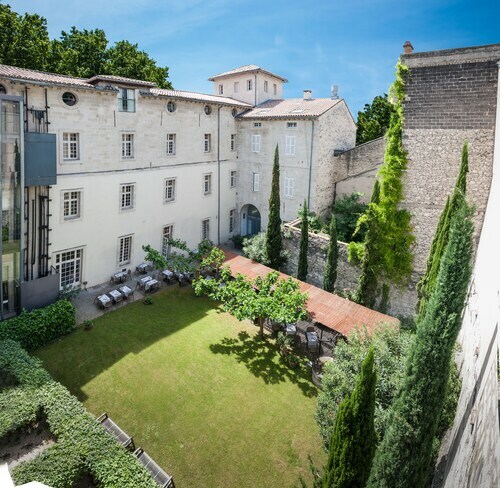 This family-friendly Saint-Maximin property is within 3 mi (5 km) of Haribo Candy Museum, Uzes Cathedral, and Place du Marche aux Herbes. Chateau Ducal dit le Duche and Office of Tourism Pays d'Uzes are also within 3 mi (5 km). Situated in Saint-Maximin, this guesthouse is within 3 mi (5 km) of Haribo Candy Museum, Uzes Golf, and Jardin Medieval. Place du Marche aux Herbes and Uzes Cathedral are also within 3 mi (5 km). Situated in Saint-Maximin, this property is 1.8 mi (2.8 km) from Haribo Candy Museum and 2.7 mi (4.3 km) from Uzes Golf. Pont du Gard and Uzes Cathedral are also within 6 mi (10 km). Situated in Saint-Maximin, this vacation home is within 3 mi (5 km) of Haribo Candy Museum, Uzes Golf, and Jardin Medieval. Place du Marche aux Herbes and Uzes Cathedral are also within 3 mi (5 km). How Much is a Hotel Room in Saint-Maximin? Hotels in Saint-Maximin start at per night. Prices and availability subject to change. Additional terms may apply. Visitors to Gard who are seeking a place to rest and relax close to Saint-Maximin have a superb range of accommodations options. If you're planning to make memories in Saint-Maximin, Travelocity offers 13 boutique and affordable hotels within a 6-mile (10-kilometer) distance of the downtown area. Some Travelocity-listed hotels located just a short drive from the town center of Saint-Maximin are the Hostellerie Le Castellas and Hotel Restaurant Le Gardon. Have a look at the La Maison d'Ulysse along with the Villa Regalido. The La Maison d'Ulysse is located only 10 miles (15 kilometers) from central Saint-Maximin. The Villa Regalido, can be found 20 miles (35 kilometers) away. 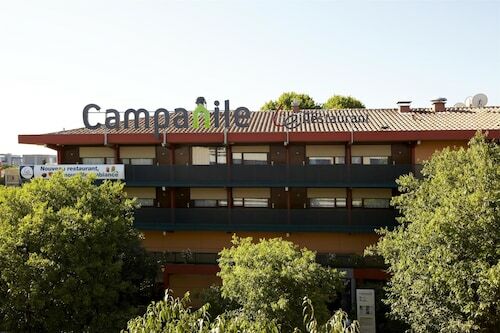 Some more hotel and apartment options in the vicinity are the Château d'Arpaillargues as well as the Holiday Inn Petite Camargue. Like to make your way a bit out of the center? Languedoc-Roussillon offers many beautiful things to see. Languedoc-Roussillon proudly offers beaches, coastal plains, rivers and canals. Commonly visited traveler attractions are ruins. Adventurous travelers can love snowboarding, skiing and cross-country skiing here. Mialet is 25 miles (44 kilometers) west of Saint-Maximin and boasts Musee du Desert and Trabuc Caves. If you spend a few nights in Mialet, be sure to check out the Auberge du Peras and Le Pradinas. 3 miles (4 kilometers) to the northwest of Saint-Maximin, is Uzes, home to the Relais du Silence Le Clos de Pradines and Best Western Uzes Pont Du Gard. While in Uzes, make sure you venture to the Uzes Cathedral and Chateau Ducal dit le Duche. Why not spend a few hours enjoying the skills of players in the company of avid supporters at a community game. Park&Suites Arena is located 40 miles (61 kilometers) to the southwest of Saint-Maximin. Any sports fans that hope to book Travelocity-listed hotels in the area surrounding the game should choose between the San Marco or the Inter-Hotel Neptune. Located 25 miles (37 kilometers) from central Saint-Maximin is Caumont Airport. Find nearby Travelocity-listed accommodation at Auberge De Noves or La Livrée du Palais. Nice newer hotel. The location was excellent, just a short walk to the train station and across from the beautiful town wall. The room were large, clean and comfortable. There was a nice exercise room. Breakfast was plentiful, fresh and really tasty. The staff was all super friendly and helpful. lovely owners...helped in several extra ways to make us comfortable. Their restaurant on sight was really good and I always ended our dinner with the soufflé which needs to be ordered at the beginning of the meal. They are beautiful and delicious. Aparthotel Adagio is a comfortable hotel/apartment, which is most suitable for young people. The rooms are nice and clean and the staff is very polite. We were 4 older women friends and stayed in two rooms. The hotel is a very lovely setting hidden behind very unassuming entrance. The rooms were very modern but had minor maintenance issues (rocky toilet in one room, slightly smelly toilet, rocky faucet, and balcony light which was on at night and switch was not apparent, necessitating turning off all the electricity to the room. In addition, the coffee pot did not work in one room but was immediately replaced when reported to the front desk). The rooms were very large, clean, and well- furnished, with a patio balcony containing a table and chairs as well as desk and sitting areas. The public areas are spacious and simply grand.